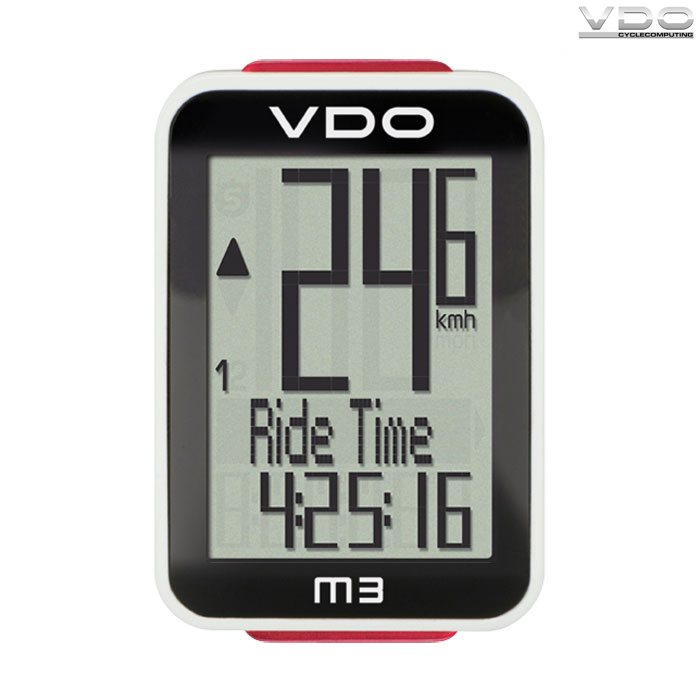 The VDO M3 is a wired model specifically aimed at the target group of road bike riders and impresses with it's small, light structure and easy-to-read portrait-format display with large digits. This display always simultaneously shows two (VDO M3) functions so that all key data is always in view while riding. All the important bike functions such as the speed, average speed, maximum speed, ride time, ride distance, total distance, time and temperature are stored within the VDO M3's small computer housing. The integrated roadbook function is a particular highlight. This separate distance counter (which counts forwards or backwards) can measure individual section distances during a ride so that roadbook routes can be perfectly followed. This makes the VDO M3 the ideal companion for mountain bike rides on any terrain. The new wired models VDO M3 is small, chic and highly functional.